Major Claude Eatherly seemed to be a typical young American. He volunteered for the Air Force in 1939 and was treated for battle fatigue in 1943. After receiving a couple of weeks treatment he was appointed commander of the bomber group responsible for the Hiroshima and Nagasaki raids which dropped the first nuclear bombes on huge civilian populations. Two hundred thousand people died in these raids. For this he was called a hero. It is reported that after the experience he spoke to no one for several days. As time went on he became ever more burdened by guilt and talked continually about the need for atonement. His attitude was seen as embarrassing and he was sent to the WACO mental home by the authorities. He was eventually certified. His suffering was further intensified because he was labelled as having a pathological guilt complex and thereby seen as mentally ill. 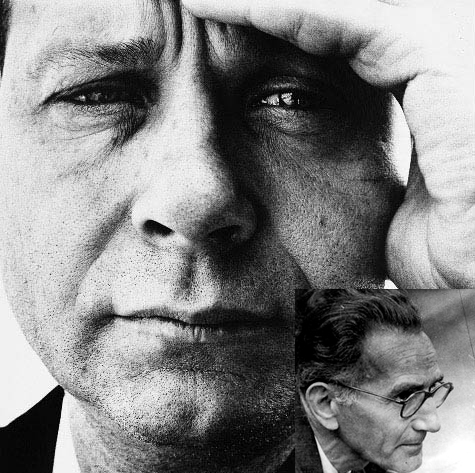 In 1953 the Austrian pacifist and philosopher Günter Anders learnt of Eatherly's situation and wrote him a letter. This letter was the beginning of a long correspondence and friendship which lead to Eatherly becoming an active member of the peace movement and his release from hospital. Until he heard from Anders no one would allow Eatherly to say what he had done was wrong. He had therefore become more and more mentally unstable. In acknowledging his guilt and being able to call his pain and unease normal rather than pathological, he was able to believe in himself again and to begin to work constructively for a different future. The Machinery had functioned blamelessly, and you were young and lacking in insight. You have done it, but since you have done it we can learn from you, and only you, what would become of us if we had been you, if we would be you. You see you are terribly important to us, even indispensable. So to speak, our teacher. For us the fact you can not master what is done is consoling … it proves that you have been able to keep your conscience alert, although once you had functioned as a screw in a machine… And since you have been able to do this, you have proven that one is able to do this, that we must be able to do this. ‘At the time I knew not what I did, but now I do know, and I know this must never happen again, and that no human being ought to be allowed to demand such a thing from another human being…your fight is my fight, no more Hiroshima’…You may be sure that with such a message you would make this day of mourning a day of rejoicing and the survivors of Hiroshima would receive you as a friend…since you also are a victim of Hiroshima. With deep esteem, which I have for every Hiroshima victim, I am yours sincerely, Günter Anders.